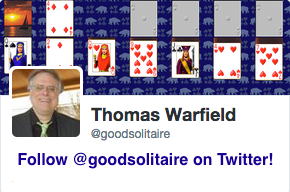 A new release of Pretty Good Solitaire (for Windows) is now available. Version 13.2 is available for download from http://www.goodsol.com/download.html . Version 13.2 contains 10 new games, bringing the total number of games to 780. The new games are Alloway Kirk, Five Pirates, Kettle Hill, McCarver, Open Peek, Pyramid Rank, Richard's Patience, Undercover Aces Easy, Weddings, and Yukon Two Suits. The layout of the popular game Pyramid has also been redesigned. You can download Pretty Good Solitaire version 13.2 from http://www.goodsol.com/download.html . Be sure to exit the game before you install. Pretty Good Solitaire version 13.2 is a free update for those who originally ordered version 12 or 13 (ordered after October 25, 2007) or those who paid for an upgrade during that time. However, it is not a free upgrade for those who originally ordered version 11 or earlier. The quickest way to determine whether version 13 is a free upgrade for you is to simply download version 13 and enter your code (or, if you have the previous version installed with the code entered, the new version will find your code automatically). If your code worked in version 13.0 or 13.1, it will work in version 13.2. If you need to upgrade, version 13 will tell you and direct you to the upgrade page at http://www.goodsol.com/upgrade.html . If you don't need to upgrade, your code will just work. 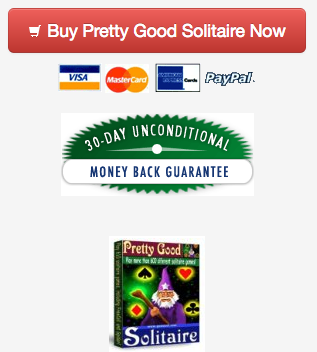 Pretty Good Solitaire version 13.2 is US$24.95, plus an optional $7.50 shipping for a CD-ROM. In addition to installing the basic game, the CD-ROM also installs all of the currently available extra card sets. This game is at Open Peek.